You are currently browsing the tag archive for the ‘horoscopes’ tag. 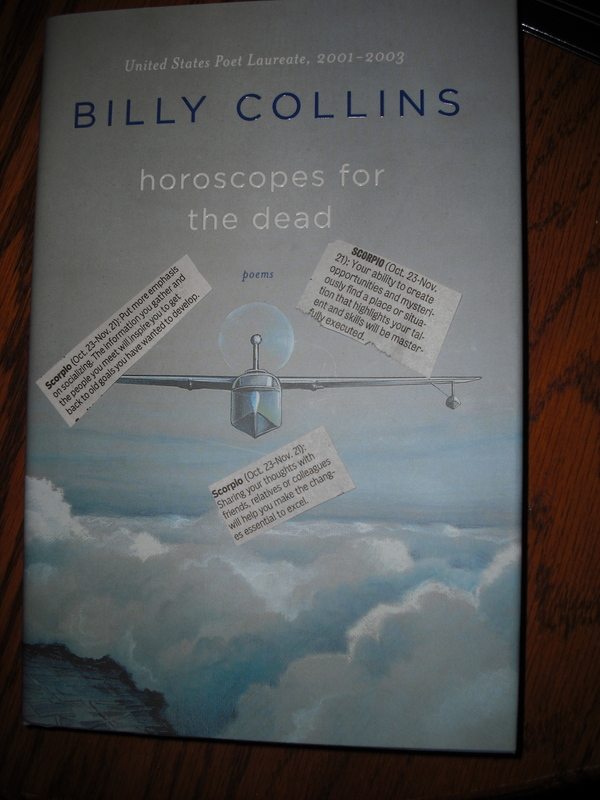 A week or two ago, as I flipped through our alumni magazine from Holy Cross and saw that fellow alum Billy Collins ‘s latest book is called Horoscopes for the Dead, I knew I had found the perfect 50th birthday gift for a friend of mine. She and I are both Scorpios and the last year we’ve had fun sprinkling a little horoscope silliness into our conversations about neighborhood or work or family. For the last year, I clipped dozens of memorable ones from the paper, making messes all over my house. I think I meant to do something creative last Christmas for her, but regardless of the creative tear our horoscope said we were on, I just left the crumpled and ripped pieces of paper to gather dust in three rooms of my house. At some point I put most of them in a folder. Progress of sorts. Finally, with her 50th birthday approaching, I knew the time was now, but I had no idea what to do that wasn’t completely lame. Pasting them on a poster board just wasn’t going to cut it. Thank God for Billy Collins and his way with words! I bought the book (read a few poems myself and trimmed the horoscopes I deemed worthy of inclusion. Then I scattered them in the pages. Minimalist creativity is my favorite kind. Let Billy do the heavy lifting and I get the credit! It helps that most of the horoscopes I’d clipped refer to the creative roll we were on for a while–an energetic arc that was unstoppable until it shrivelled and stopped. It also helps that we don’t put much stock in all of that. It makes more sense to read a Billy Collins poem a day and take that for what its worth. This friend’s twin sister, who not coincidentally celebrated her 50th birthday last week as well decided she wanted to have a party to honor the occasion. A friend and neighbor offered her the perfect room for the affair–with not a view exactly, but a worldview, shall we say. This 50th birthday party was held in the basement of a funeral home. I can only hope some Billy Collins was recited. My horoscopes have been impressively good of late. Mine today didn’t say one thing about getting dressed and brushing my teeth, though. It took me a while to realize I’d better improvise. Too bad the recent horoscopes didn’t foresee the tree falling at my mother’s house during a snowstorm two days after I left it forever I hope and four days before new renters/eventual owners move in, I REALLY hope. It didn’t hit the house, but did block the street in such a way that the county snowplow ignored it and barreled onto a neighbor’s lawn to create a new street which all the other neighbors used, thereby ruining these nice neighbors’ front yard. After other nice neighbors took a chainsaw to the tree to open the road, they had to shovel 8 inches or more of snow for many many feet where the plow had not gone. I’m sure all the neighbors miss us so.